This picture is taken from the March 2015 edition of Problem Pictures Numbers, a CD-ROM of photographs with activities for mathematics teaching. The picture shows runners leaving their starting blocks on a 200 metre sprint. They all finish at the same line, so why don't they start at the same line? In a 200 metre race, the runners must stay in their own lanes for the whole race. They go half way around the running track, beginning on a semicircular section and ending on a straight section. Their starting positions are staggered. Is this fair? 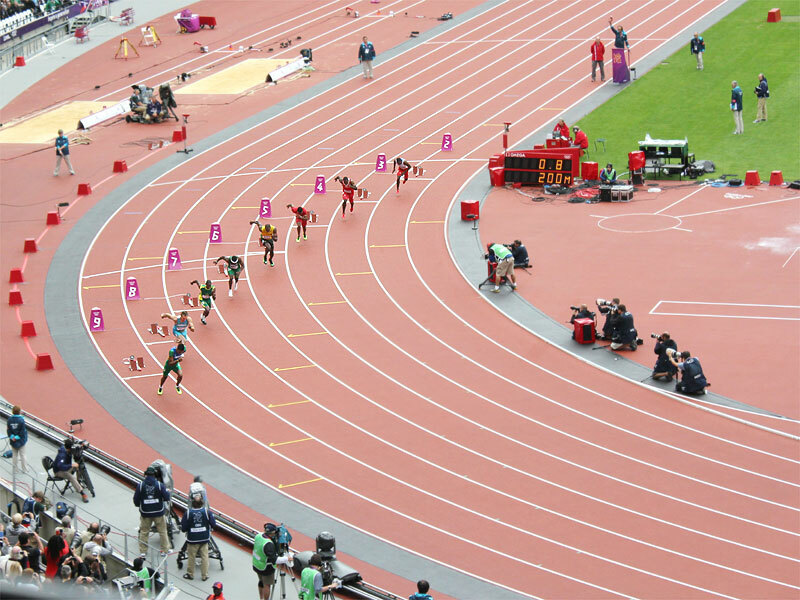 According to IAAF regulations, the staggered starts must be 3.833 metres apart and the distance between the lanes must be 1.220 metres. What well known mathematical constant do you get when you divide 3.833 by 1.220? Can you explain this? Find out about the starting positions for a 400 metre race, and for other lengths of race. The picture was taken at the 2012 London Olympics. The runner in lane 5 is Usain Bolt. The photographs and screen images on this website are copyright and may not be reproduced without permission. Copyright © Richard Phillips 2001/2015. Page updated 22 February 2015.